That propaganda has an irrational character is still a well-established and well-recognized truth. The distinction between propaganda and information is often made: information is addressed to reason and experience—it furnishes facts; propaganda is addressed to feelings and passions—it is irrational. There is, of course, some truth in this, but the reality is not so simple. For there is such a thing as rational propaganda, just as there is rational advertising. Advertisements for automobiles or electrical appliances are generally based on technical descriptions or proved performance—rational elements used for advertising purposes. Similarly there is a propaganda based exclusively on facts, statistics, economic ideas. Soviet propaganda, especially since 1950, has been based on the undeniable scientific progress and economic development of the Soviet Union; but it is still propaganda, for it uses these facts to demonstrate, rationally, the superiority of its system and to demand everybody’s support. American propaganda in the form of “rational and factual” news bulletins of the American services “based on ‘knowledge’ and information”. 9 Ernst Kris and Nathan Leites have correctly noted the differences, in this connection, between the propaganda of 1914 and that of 1940: the latter is more sober and informative, less emotional and moralistic. As we say in fashionable parlance, it is addressed less to the superego and more to the ego. Purely impassioned and emotional propaganda is disappearing. Even such propaganda contained elements of fact: Hitler’s most inflammatory speeches always contained some facts which served as base or pretext. It is unusual nowadays to find a frenzied propaganda composed solely of claims without relation to reality. It is still found in Egyptian propaganda, and it appeared in July i960 in Lumumba’s propaganda in the Belgian Congo. Such propaganda is now discredited, but it still convinces and always excites. Modern man needs a relation to facts, a self-justification to convince himself that by acting in a certain way he is obeying reason and proved experience. We must therefore study the close relationship between information and propaganda. Propaganda’s content increasingly resembles information. It has even clearly been proved that a violent, excessive, shock-provoking propaganda text leads ultimately to less conviction and participation than does a more “informative” and reasonable text on the same subject. A large dose of fear precipitates immediate action; a reasonably small dose produces lasting support. The listener’s critical powers decrease if the propaganda message is more rational and less violent. It is exactly the same with all rational, logical, factual propaganda. After having read an article on wheat in the United States or on steel in the Soviet Union, does the reader remember the figures and statistics, has he understood the economic mechanisms, has he absorbed the line of reasoning? If he is not an economist by profession, he will retain an over-all impression, a general conviction that “these Americans (or Russians) are amazing. . . . They have methods…. Progress is important after all,” and so on. Similarly, emerging from the showing of a film such as Algérie française, he forgets all the figures and logical proofs and retains only a feeling of rightful pride in the accomplishments of France in Algeria. Thereafter, what remains with the individual affected by this propaganda is a perfectly irrational picture, a purely emotional feeling, a myth. The facts, the data, the reasoning—all are forgotten, and only the impression remains. And this is indeed what the propagandist ultimately seeks, for the individual will never begin to act on the basis of facts, or engage in purely rational behavior. What makes him act is the emotional pressure, the vision of a future, the myth. The problem is to create an irrational response on the basis of rational and factual elements. That response must be fed with facts, those frenzies must be provoked by rigorously logical proofs. 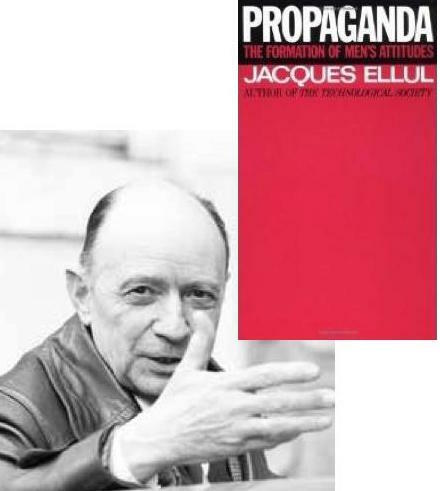 Thus propaganda in itself becomes honest, strict, exact, but its effect remains irrational because of the spontaneous transformation of all its contents by the individual. We emphasize that this is true not just for propaganda but also for information. Except for the specialist, information, even when it is very well presented, gives people only a broad image of the world. And much of the information disseminated nowadays—research findings, facts, statistics, explanations, analyses—eliminate personal judgment and the capacity to form one’s own opinion even more surely than the most extravagant propaganda. This claim may seem shocking; but it is a fact that excessive data do not enlighten the reader or the listener: they drown him. He cannot remember them all, or coordinate them, or understand them; if he does not want to risk losing his mind, he will merely draw a general picture from them. And the more facts supplied, the more simplistic the image. If a man is given one item of information, he will retain it; if he is given a hundred data in one field, on one question, he will have only a general idea of that question. But if he is given a hundred items of information on all the political and economic aspects of a nation, he will arrive at a summary judgment—“The Russians are terrific!” and so on. A surfeit of data, far from permitting people to make judgments and form opinions, prevents them from doing so and actually paralyzes them. They are caught in a web of facts and must remain at the level of the facts they have been given. They cannot even form a choice or a judgment in other areas or on other subjects. Thus the mechanisms of modem information induce a sort of hypnosis in the individual, who cannot get out of the field that has been laid out for him by the information. His opinion will ultimately be formed solelv on the basis o£ the facts transmitted to him, and not on the basis of his choice and his personal experience. The more the techniques of distributing information develop, the more the individual is shaped by such information. It is not true that he can choose freely with regard to what is presented to him as the truth. And because rational propaganda thus creates an irrational situation, it remains, above all, propaganda—that is, an inner control over the individual by a social force, which means that it deprives him of himself. I am painfully aware of the number of series I have started on Vridar and that are still not complete. The most recent one is my series of posts examining the arguments for and against the term “rulers of this age” in 1 Corinthians 2:6-8 meaning spiritual powers as opposed to earthly authorities (in particular Herod, Caiaphas, Pilate) or even the combination of earthly and demonic powers. The reason for this waywardness is that as I go through an article or chapter point by point I always come across citations (or recollections in my own mind) that alert me to either an alternative explanation or a supportive collection of evidence. It is my habit, or is it a compulsion, to follow those citations, recollections, alternatives or contradictions, supportive or related information. And as I follow those side-tracks I often come across something that reminded me of a point I posted a while ago and that could be augmented further. The additional information I want is often delayed in arriving because sometimes I can only access some sources by inter-library loan or an online purchase of a second hand book somewhere. Even if I can access a source sooner it still takes me time to read it and follow up further important-looking citations. So do forgive me my out-of-control meandering through the many tributaries of information that deflect me from my original intention to finish a series within a handful of posts within a week or no more. I should say to myself, No excuses. Just finish one job at a time as if I am a student with a deadline that has to be met or fail!